Yes, this bad boy is off his meds...again. I got the inspiration from an adorable sock snowman on Then She Made. She has a great tutorial, so please check it out! I was thrilled at how quickly and easily it came together. I stole a sock from Hubby and used one of my Nightmare Before Christmas socks for his little outfit. I used a 12" length of 20 gauge wire to stick through the rice filled sock for arms and hands. I used Tulip Beads in a Bottle for the face - Ruby, Onyx and Pearl. The hat is sporting a Smeared Ink stamp called Flying Skull. His handlers are coming for him now, so off to Lisa Hall for some more fabulous fun! You are too funny! Thanks! Oooohhhhhh I love him! The cutest scary snowman EVER! Thank you so much, Leigh! Candace I am so glad you are playing in the 12 Days...I so enjoy your creations and your posts are hilarious. A great start to my morning. Love the snowman...I have to remember to look past the cute and envision an altered version. This is just a fantastic project! 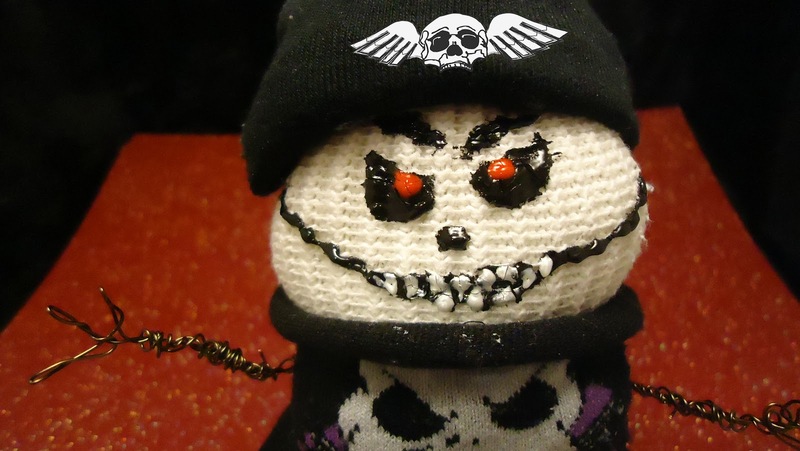 The ill tempered snowman is awesome art. 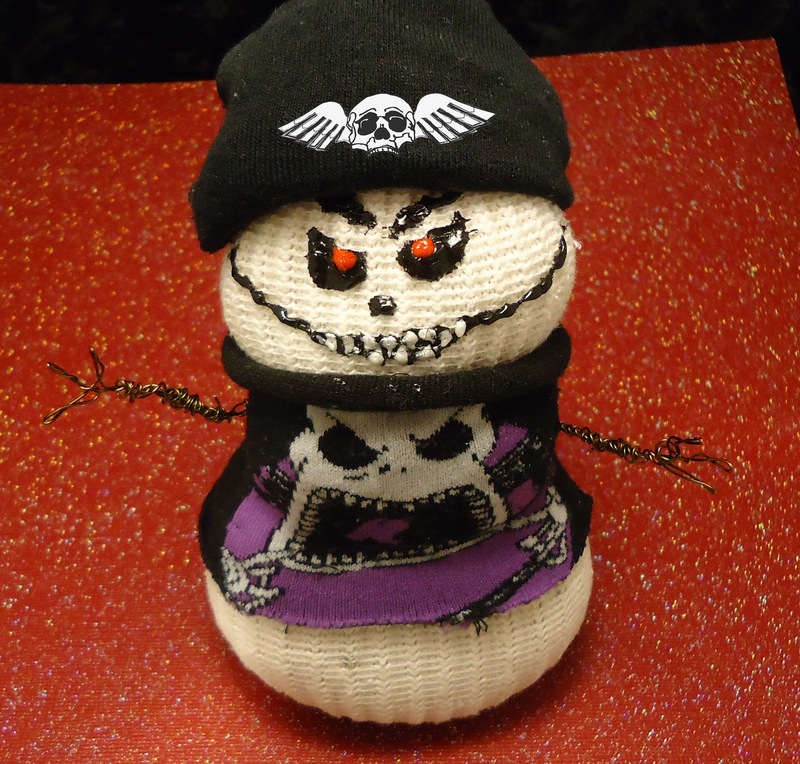 Love,Love, LOVE your sinister snowman!!! His face is too creepy cool!!! Love this... best ever! I need him to come live with me hehe. Just fabulous! Thank you Carla! You can't believe how easy he was to make! Oh my gosh I totally love you did a wonderful job on him! Thank you so much Kristy! Oh he's sooooo fabulous! I want him! I love it when people get me! Thanks, Ike! That is the most awesomest snowman I've ever seen! Love him! I might just have to see if I can make one :) Fab work! THank you Steph! You won't be able to make just one! Thank you so much, Grainne! I love this so much! I probably won't have time to leave comments on everything, but I will definitely make time to see your creations and watch your tutorials as yours is always one of my favorite stops!